Welcome to Skin and Bones, the home of Les Starkey on the web. 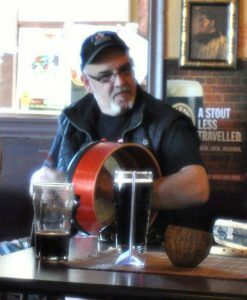 Here you can learn about Les, his love of the Bodhrán, and how those things can enhance your life in various ways. You can learn about Les’ love of the bodhrán itself, you can obtain a bodhrán, or a handcrafted tipper, made with great love. You can find out about group lessons or private ones, or read about specific tips for playing. Les has some good advice to players beginning to attend sessions as well. Learn how you could engage Les and his friends for a gig.